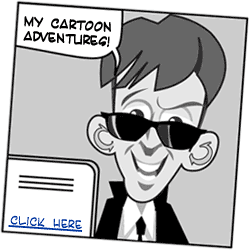 Below are spy coloring page for Mister E. on a Mission. To you it may seem that he's just sitting on a bench, minding his own business. But the truth is that he's very much aware of his surroundings, and that he's on the lookout for his next target. And when he spots him, he'll go after him to watch his every move... but without getting spotted himself. Plus he'll make photo's of those villain's secret plans! Instructions: Click on one of the spy coloring images below, this will open up the picture in it's own window/tab on your browser. Then type Ctrl+P (Windows) or Cmd+P (Mac) (Ctrl+P means that you first type and hold the Ctrl-key, and then you type the P. This means that both keys are typed together).This will show the Print window on your computer, where you can select the correct printer. Most of the time the setting will be correct. If all else fails, ask an adult to help you! I hope you'll enjoy! Happy spy coloring!